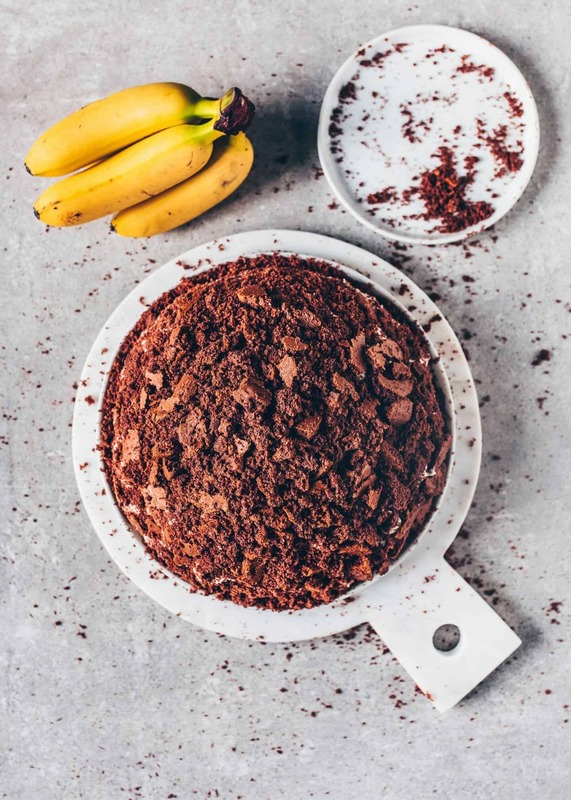 This German vegan Mole Cake is a delicious Banana Cream Chocolate Cake which is quick and easy to make. 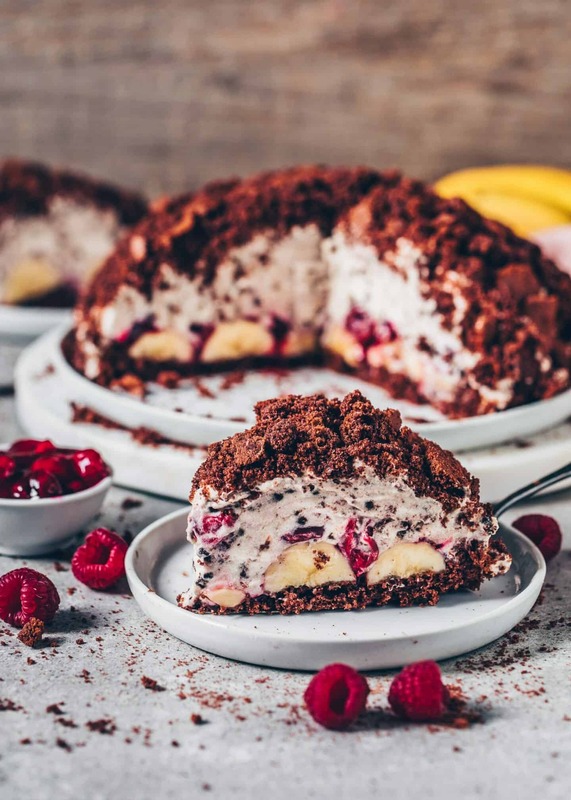 It’s made of a soft Chocolate Crumble Cake and filled with bananas, whipped stracciatella cream, and cherry compote. This recipe includes step-by-step pictures. Have you ever heard of „Mole Cake“? Here in Germany, it’s very popular, everyone loves it! 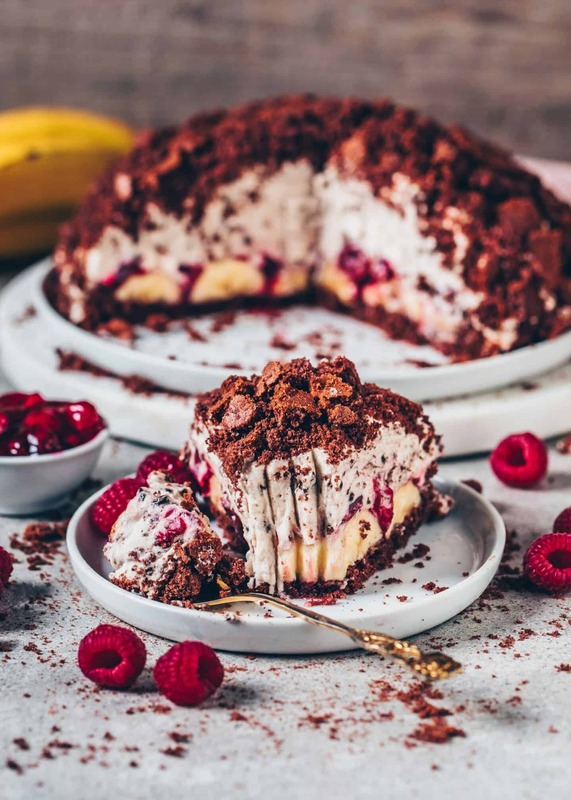 I mean, who doesn’t love a delicious banana cream chocolate cake? Especially when it also has a fruity cherry compote, it most certainly takes this cake to the next level! Do you like the cherry banana combination too? If so, you should definitely not omit it. 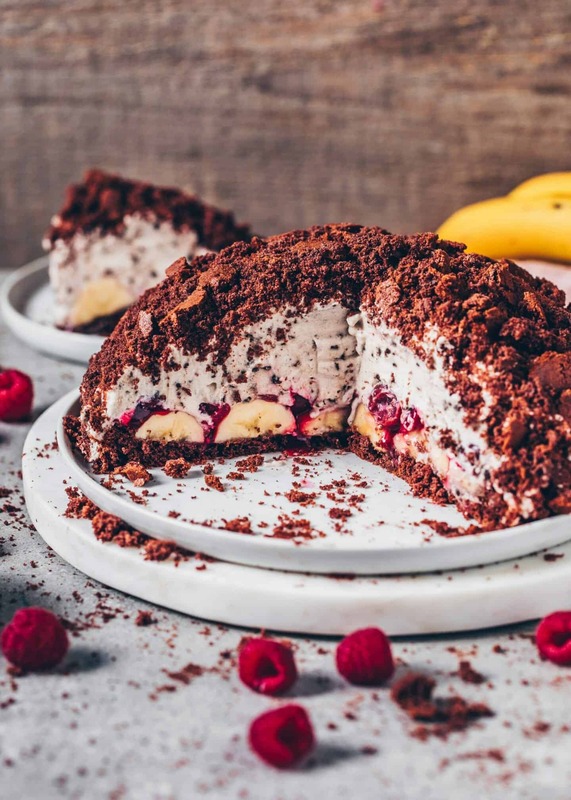 The great thing about this recipe is that this banana cream chocolate cake is not only incredibly delicious, but this mole cake comes together super fast! You only need to whip up the cream and bake the soft Chocolate Crumble Cake. 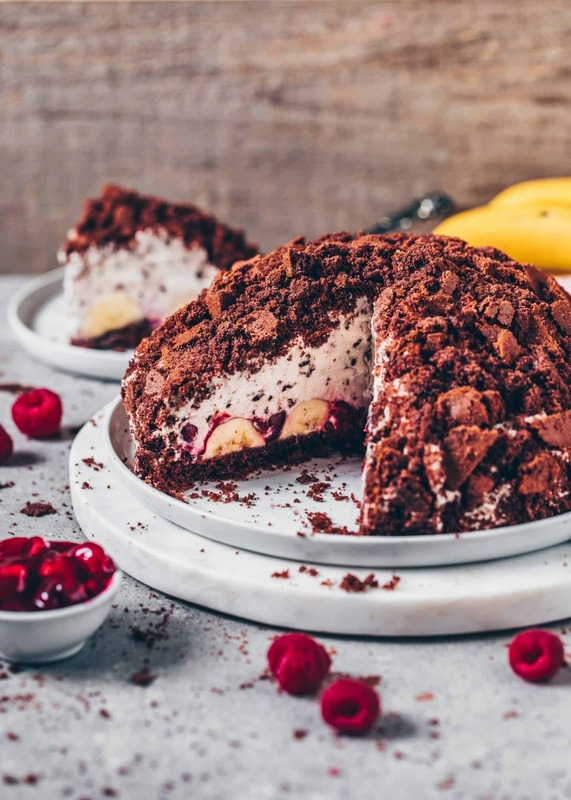 Once the chocolate cake is cooled gently scoop out the middle of the cake using a tablespoon, leaving a 0,4-inch (1-cm) bottom and 0,6-inch (1,5-cm) rim. To create an even rim, I like to lightly scratch a circle inside the cake with a knife before scooping it out. You can crumble the scooped out cake into a bowl and set it aside because we’ll use it for the topping later. 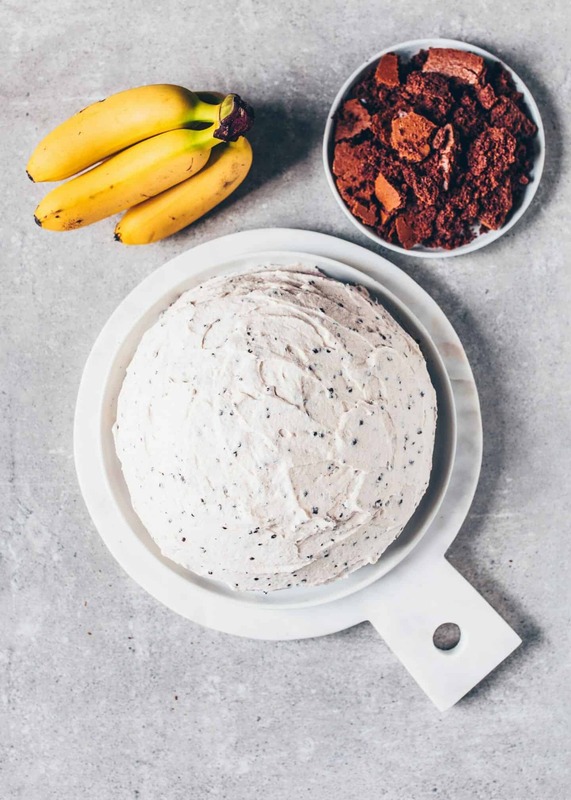 Firstly, peel the bananas and cut them in half lengthwise, then place the halved bananas on the scooped out cake. Secondly, if you’re using cherry compote, spread that on now. Thirdly, add the whipped cream on top and spread to form a pile. Lastly, cover the pile of cream with the scooped out chocolate cake crumbles and press down gently. Now your vegan Mole Cake should look like a molehill! 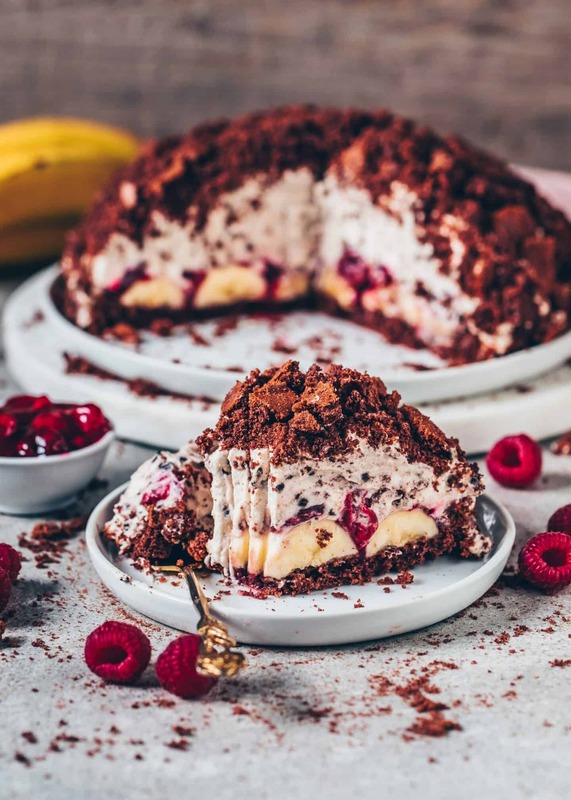 Make this Banana Cream Chocolate Cake with any fruits you like! 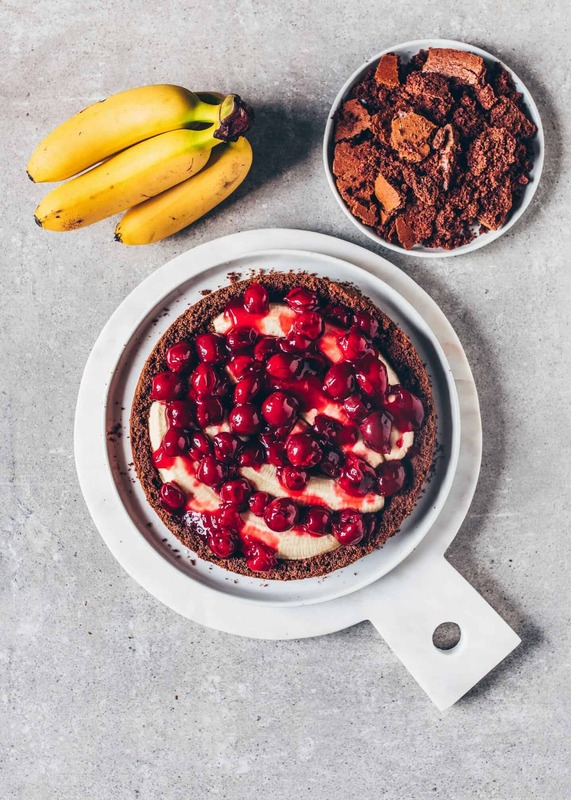 If you’re not a big fan of combining cherries and bananas, don’t worry, because this cake even tastes amazing when it’s made with bananas only. However, you can also add cherries only, or any other fruits you want. 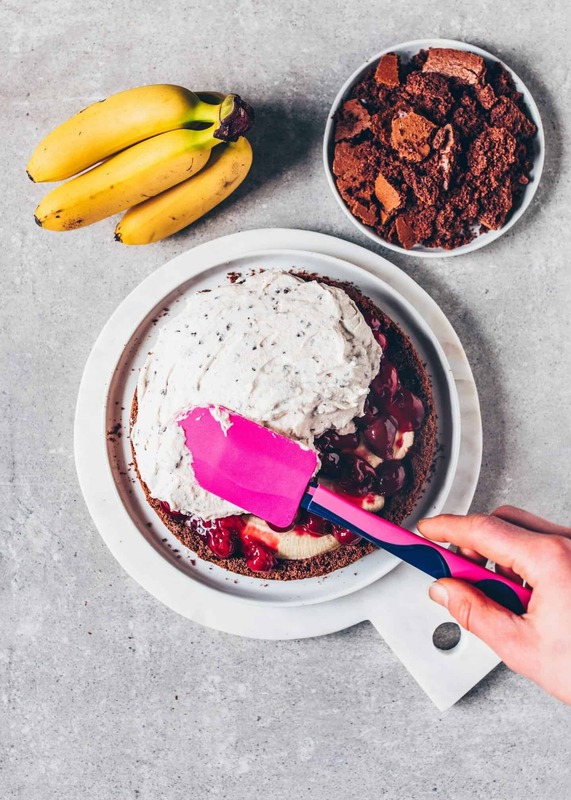 In spring or summer, I also like to prepare this vegan Mole Cake with fresh seasonal strawberries, raspberries or blueberries. I haven’t tried it with canned mandarin oranges, peaches or nectarines yet, but I will definitely do that soon. 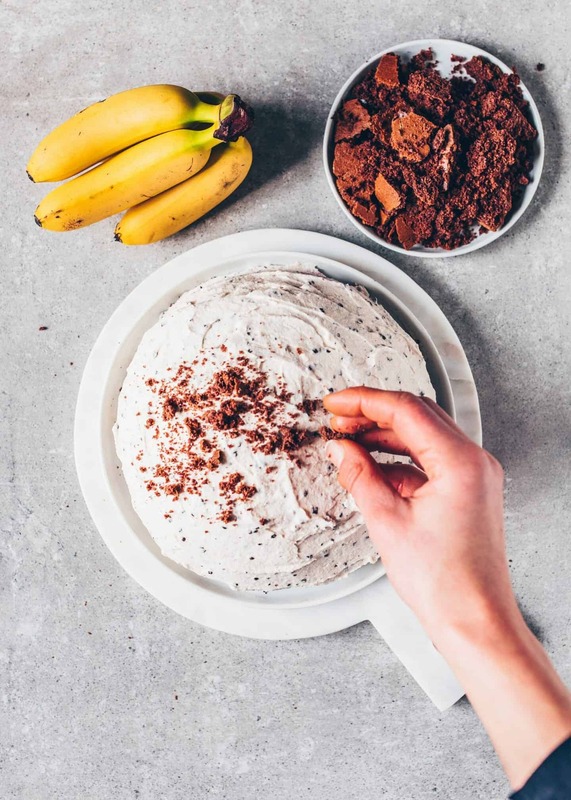 As you can see, this Banana cream Chocolate Cake is one of those simple cakes that you can bake and enjoy all year round. There are no seasonal or extraordinary ingredients required, so you only need ingredients you might already have at home. If you’re vegan make sure to use good non-dairy whipping cream. I recommend using this one because I always have great results with it. The perfect Cake for any occasions! 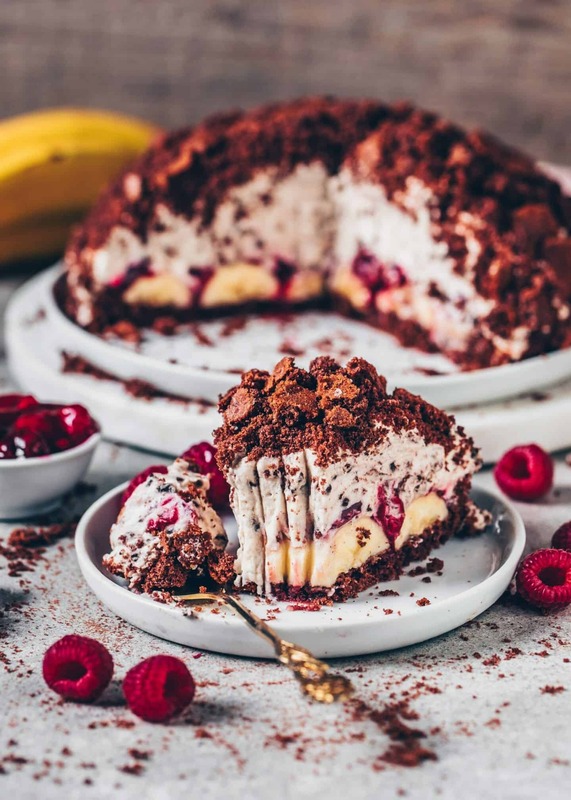 You can prepare this Banana Cream Chocolate Cake for so many occasions! It’s perfect for a birthday, picnic, tea and coffee party or when you just want to chill on a cozy afternoon. 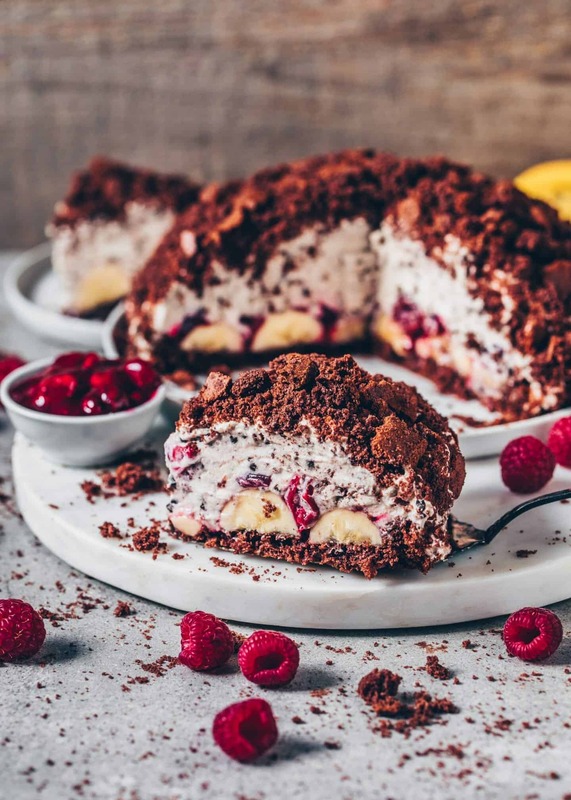 No matter how old your family members and friends are, I assure you that not only children but also adults and grandparents will love this German Mole Cake! 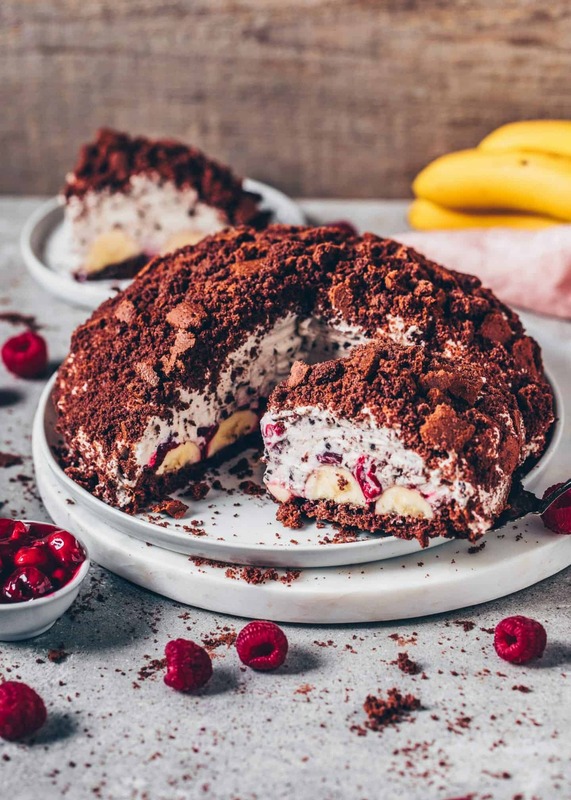 Want more vegan Cake recipes? 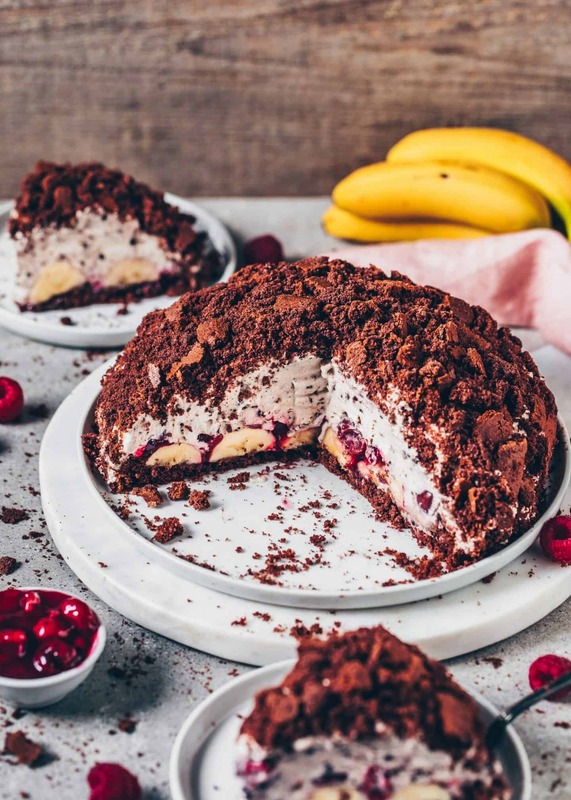 This German „Mole Cake“ is a delicious Banana Cream Chocolate Cake which is quick and easy to make. 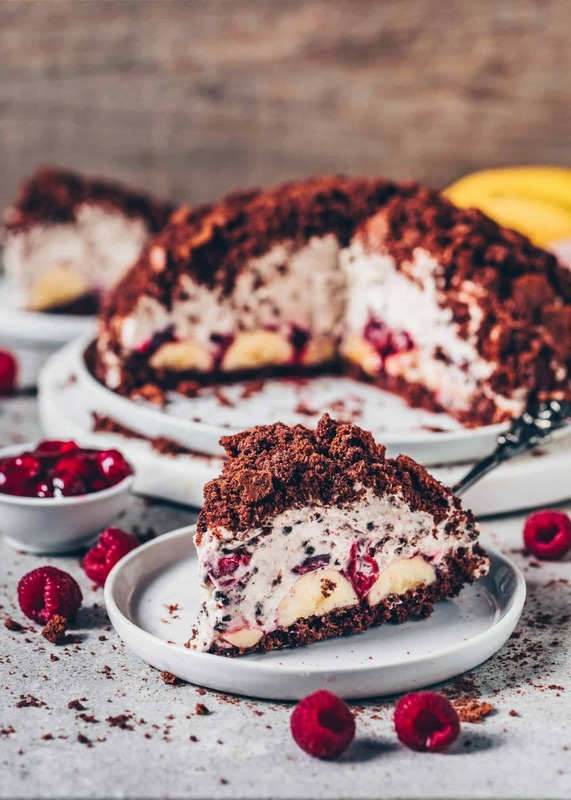 It’s made of a soft Chocolate Crumble Cake and filled with bananas, whipped stracciatella cream and cherry compote. Preheat oven to 355°F (180°C) and grease a 7,9/8,7-inch (20/22-cm) round baking tin. Mix soft vegan butter with the sugar and mashed banana until creamy using an electric hand mixer. In a small cup, stir baking powder into apple cider vinegar. Set aside. Combine flour, cornstarch, cocoa, and salt in a bowl. Add the butter-sugar-banana cream and, gradually, add non-dairy milk along with the baking powder vinegar mixture, stirring to combine. (Add a little more milk, if needed). Fill the dough into the greased baking tin and bake for about 35 minutes, or until an inserted toothpick into the middle of the cake comes out almost clean. Allow to cool afterwards. 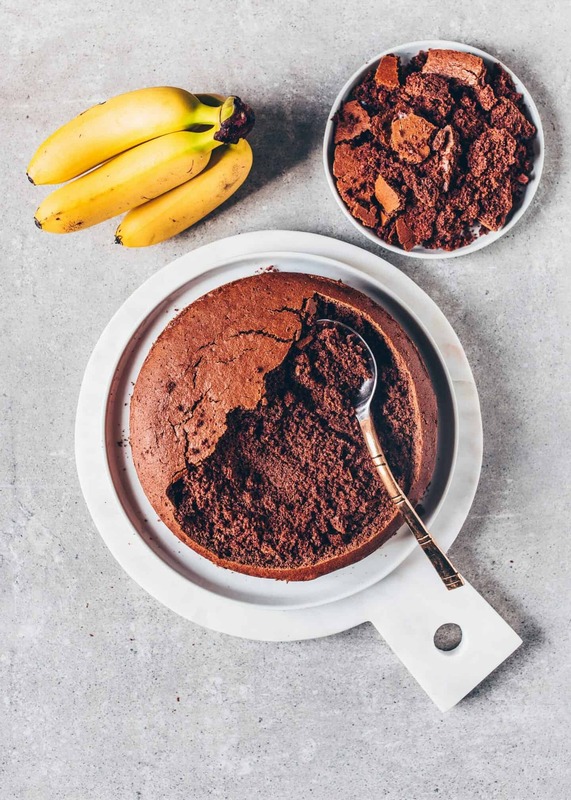 Once cooled, gently scoop out the center of the chocolate cake using a tablespoon, leaving a 0,4-inch (1-cm) bottom and 0,6-inch (1,5-cm) rim. (To make sure you create an even rim, slightly scratch a circle inside the cake with a knife before scooping out). Crumble the scooped out cake in a bowl and set aside for the topping later. Beat cream with an electric hand mixer on high speed for about 1 minute. Add powdered sugar, cream stabilizer, and vanilla and continue beating until stiff. Carefully, fold in shredded chocolate using a spatula. Refrigerate until ready to use. Peel the bananas and cut them in a half lengthwise. 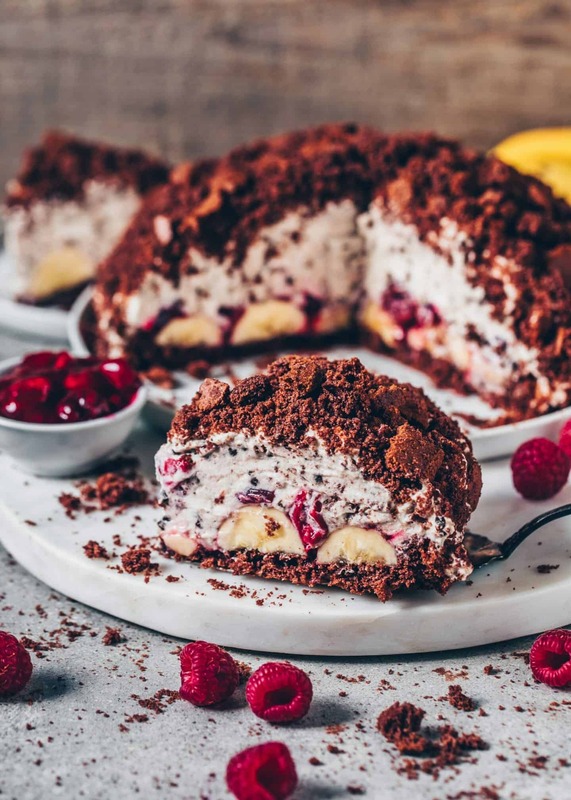 Place on the scooped out cake and, optionally, also spread over cherry compote (or other fruits). Add the whipped cream on top and spread to form a pile. Cover the cream with the scooped out cake crumbs and press down gently. Let the cake chill at least 2 hours in the fridge before serving. To make this cake reduced in sugar you can use a sugar substitute. Agave syrup, maple syrup, date syrup or coconut sugar is fine too. I use this non-dairy cream for whipping because I always have great results with that. However, you could also use another whipping cream. You can add any kind of chocolate and fruits to taste. Such an easy and brilliant recipe! The cake turned out absolutely amazing. My family and I looooove it. 🙂 Thank you so much Bianca.